Media Coverage | Miguelito's Little Green Car. We are all connected. In the wee hours of February 11, 2011 I was at the CTV Studios for a live interview with Omar Sachedina that was broadcast live across Canada on CTV’s Canada AM, Canada’s most watched national morning program. Laurel Clark of Global TV Edmonton interviewed me about Miguelito’s Little Green Car for a segment that was broadcast on July 12 and 13, 2012AM. I was invited to make a presentation about Miguelito’s Little Green Car at the very popular Pecha Kucha Night series of presentations to a sold-out crowd numbering over 525 at Edmonton’s Garneau Theatre. All on three hours of sleep. Archived on YouTube by the Edmonton Journal. I was interviewed by Sasha Xiao about Miguelito’s Little Green Car for Omni TV’s National News Broadcast in Cantonese on April 6, 2013. I was invited to the CTV Studios in Edmonton for a live, prime-time, on-air Miguelito’s Little Green car photo with Carrie Doll on her last day as anchor. I had the pleasure of being the first-ever guest on Scott Stratten’s UnMarketing video podcast in his studio. The segment runs into approximately 10:00. 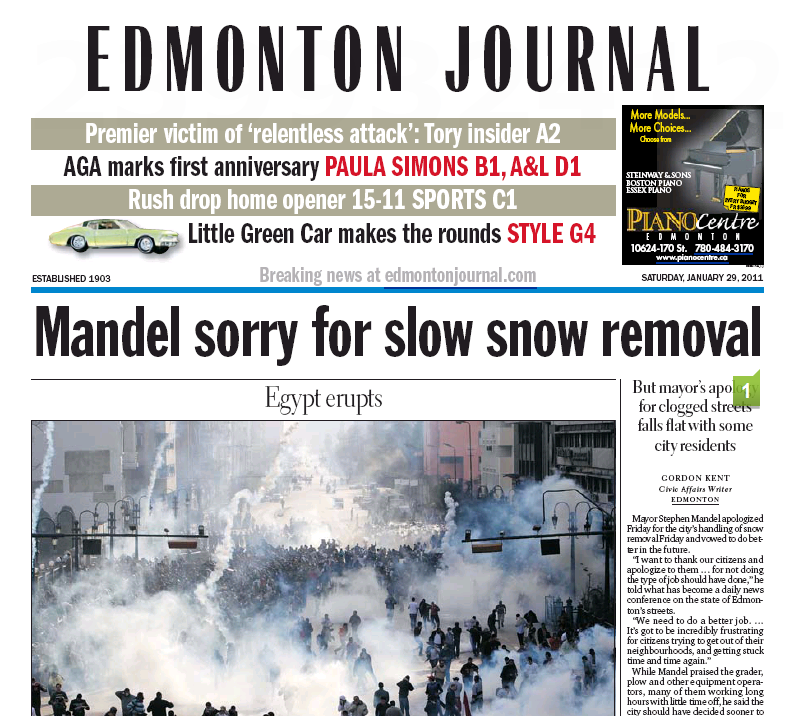 The Edmonton Journal kicked off its coverage of Miguelito’s Little Green Car, devoting two full pages plus a full color cover for the Style section in addition to showcasing the car on the cover. Reporter Marta Gold wrote the article. The article was syndicated to newspapers and websites across Canada, including Canada.com, the Calgary Herald, the Regina Leader-Post, the Montreal Gazette, the Ottawa Citizen, the Saskatoon Star-Phoenix, The Province in British Columbia, the Victoria Times-Colonist, the Vancouver Sun, and the Windsor Star and others. 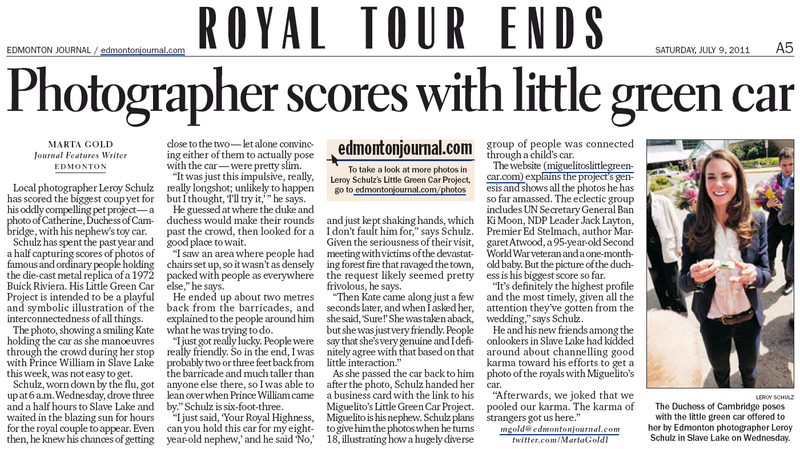 In the third of her series of articles about Miguelito’s Little Green Car, Edmonton Journal reporter Marta Gold covered my interaction with Canadian Prime Minister Stephen Harper in Ottawa during my photo shoot with him. It also covered the stories of my photos with Justin Trudea, a homeless man named Greg and others. Reporter Marta Gold, in her second article about the project, devoted a third of a page to a story of how I managed to get a photo of Kate Middleton, The Duchess of Cambridge, with Miguelito’s Little Green Car. Edmonton Journal society columnist Nick Lees devotes a third of his column to my photo with The Jackson Brothers. I was interviewed live by Robbin Reay for a segment on The Robbin Reay Show show that aired on February 26, 2013. The segment aired on both UP!99.3FM in Edmonton and UP!97.7FM in Calgary. I was interviewed by Tyler Grant of CBC Radio 1 for the Radio Active show that aired on February 16, 2012. The original link is online at http://www.cbc.ca/player/Radio/ID/2198032847/. On December 13, 2011 I was interviewed live by Paul Brown, Yukon Jack, Gillian Foote and Ry My on The Paul Brown Show for a segment on The Bear 100.3 FM. On July 24, 2011 both iNews880 AM and 630 CHED AM ran an interview by news anchor Ashley Wiebe about Miguelito’s Little Green Car. Sorry, an archive of this interview is not available.